Most brides don't picture themselves or their party as victims of hypothetical disasters on their wedding day. That's what their wedding coordinator is for and should be ready to resolve any problem that may arise on your wedding day. While you most likely won't spill red punch all over your expensive gown (please, just stay far far away from any red drink), it's good to think of some emergencies that could really happen. Rather than become a bridezilla ready to murder your new companion, it's a good idea to anticipate a couple minor hiccups, they will inevitably happen. 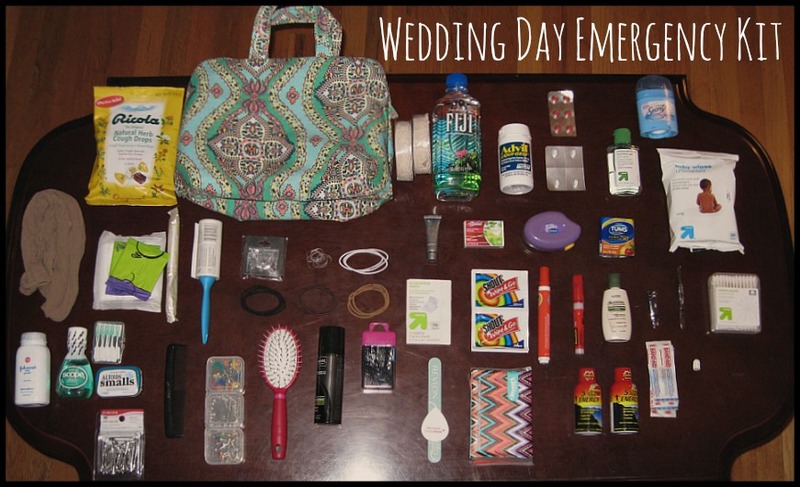 For such hiccups a Wedding Day Emergency Kit is a must and will be utilized often. If you do not have a wedding coordinator, I would highly suggest having a Wedding Day Emergency Kit somewhere close. My ever growing emergency kit includes the following.